CHICAGO, Aug. 26, 2018 /PRNewswire/ — A fire in a three-story apartment building in Chicago has resulted in eight deaths. Six children and two adults were killed after the fire broke out at 4:00 a.m. on Sunday, August 26th. Additionally, a teenager and young adult were taken to the hospital and are listed in critical condition. A firefighter was also injured while fighting the blaze. The building did not have a fire sprinkler system. Firefighters were unable to find working smoke detectors in the building. This is Chicago’s largest fire fatality loss since the Cook County Administration Building high-rise fire that killed six people in 2004. Chicago does not require fire sprinklers in existing apartments under 80 feet in height and when new apartments are constructed, fire sprinklers are not required until wood construction exceeds 30 feet in height. There have been three attempts to adopt the International Code Council (ICC) codes, which require all new apartments to have fire sprinklers and existing apartment buildings under 80 feet to have fire sprinklers when renovations occur in the building. Advocates have been educating and encouraging a change in the law for years, however, all attempts have been opposed by numerous building and real estate stakeholders. This fire joins other recent fires in underscoring the need for fire sprinklers. A fire last week in San Antonio, Texas claimed the life of one, while a fire three weeks ago in San Marcos, Texas claimed the lives of five college students. Apartment and condo buildings present unique challenges for life safety, and as facts are examined, the realization that built in fire protection is needed becomes apparent. A fire in Prospect Heights, Illinois in July caused over $10 million dollars in damage to the River Trails condominium complex and placed hundreds of citizens’ and firefighters’ lives at risk. Not only are lives lost and lives changed forever for those injured, physically and mentally, but it is a loss of housing for the community and a loss of tax base. Fire in an uncontrolled state is devastating to lives, communities, and this country. Adopting the latest national building fire codes and standards will save lives and properties for decades to come, as these tragedies are avoidable. The National Fire Sprinkler Association is firm in the belief that fire sprinklers would have changed the outcome of these fires. The deaths of these unfortunate victims were needless and preventable. 2018 has been a year when, over and over again, our Association has had to respond to fatal apartment building fires across the country. Astonishingly, sprinklers were required in apartment buildings more than two stories in height and with more than 16 dwelling units in the 2000 edition of the ICC codes. Eighteen years later, unnecessary deaths are still occurring in apartment building fires across the U.S.
NFSA’s Northern Illinois Fire Sprinkler Advisory Board has also responded to this fire, with first-hand information about Chicago issues. According to the National Fire Protection Association (NFPA), fires are more deadly today due to modern furnishings. A fire can become deadly in less than two minutes (NFPA 2018). Fire is fast. Unfortunately, children and older adults often can’t hear a smoke alarm or react fast enough to escape the smoke. Fire sprinklers are individually heat activated and only the fire sprinkler closest to fire goes off, keeping the fire small and allowing time for all to escape. We know that fire sprinklers buy time and time buys life. Fire and building codes are a minimum and should be adopted to protect lives and property in the future. About the National Fire Sprinkler Association (NFSA): NFSA was founded in 1905 and wants to create a more fire safe world, and works to heighten the awareness of the importance of fire sprinkler systems from homes to high-rise and all occupancies in between. The Association is an inclusive organization made up of dedicated and committed members of a progressive life-saving industry. This industry manufactures, designs, supplies, installs, inspects, and services the world’s most effective system in saving lives and property from uncontrolled structural fires. For more information about fire sprinklers, how they work and access to additional resources and information, visit www.nfsa.org for the latest material, statistics and a dedicated team of fire safety advocates ready to serve all stakeholders in order to fulfill the vision of a safer world. National Fire Sprinkler Association: Three Serious Residential Fires, Two with Fatalities in the Metro Area in One Week -- Now is the Time to require Fire Sprinklers! DENVER, Aug. 2, 2018 /PRNewswire/ — Within one week, three serious residential fires- two with multiple fatalities, occurred in the north metro area. None of the three residences – one single-family home and two apartment buildings – were equipped with fire sprinkler systems. The national model building and fire codes require smoke alarms and fire sprinklers in all new residential construction. When will Colorado and its communities follow these codes? On July 22nd, two people died and nine were injured in an early-morning apartment fire in Westminster, Colorado. The fire started shortly after 2 a.m. When fire crews arrived at 2:20 a.m., the building was already fully involved. While Westminster requires fire sprinklers in new residential structures they were not required when the building was constructed. On July 27th, a 68-year-old man and his 95-year-old mother died after they were pulled from their burning home by firefighters in Arvada, Colorado. On July 30th, fire at an apartment complex in Thornton, Colorado injured three people and left 15 apartments uninhabitable. It has since been determined that the fire was caused by fireworks. None of these buildings were required to have fire sprinklers when they were constructed. Rob Geislinger, Great Plains Field Service Coordinator for the National Fire Sprinkler Association, has reached out to fire marshals in each of these jurisdictions and has offered to help avoid such tragedies in the future. Ironically, the National Fire Sprinkler Association has scheduled a Side-by-Side burn demonstration at another nearby community on Tuesday, August 7. This demonstration will involve two identical fires, one in a room protected by fire sprinklers while the other room is unprotected and graphically shows the destructive power of an uncontrolled fire versus the saving power of fire sprinklers. The demonstration will occur at the Broomfield Night Out 2018 which will be held at Broomfield County Commons Park, 13200 Sheridan Boulevard. The event runs from 5:00 until 8:00, with the demonstration scheduled for 7:45. San Marcos, Texas– Several national organizations are joining together to raise awareness of the growing dangers of residential fires and the life-­‐‑saving benefits of installing fire sprinklers in dorms and off-­‐‑campus housing –whether apartments or single-­‐‑ family housing. This partnership is happening following the July 20th fire in San Marcos, Texas where five students died, six people were injured, and 200 were displaced. Many people lose sight of the fact that fires are dangerous not just to residents, but also to firefighters. Today’s new houses are built with big open designs, constructed with modern combustible materials, and they’re filled with synthetic furnishings. When they burn, they fail fast, and that environment places firefighters at risk from fire, as well as toxins that lead to disease. Older housing has its own unique set of challenges, and many times off-­‐‑campus housing is not up to the current code and may be lacking regular inspections. The organizations that are joining together to raise awareness about the need for fire prevention and education on campuses nationwide include: National Fallen Firefighters Foundation, Phoenix Society for Burn Survivors, National Fire Sprinkler Association, Common Voices, and Center for Campus Fire Safety. For more details about the National Fallen Firefighters Foundation’s Life Safety Initiatives, please visit www.firehero.org. NFFF was created by Congress to lead a nationwide effort to remember America’s fallen firefighters. Since 1992, the tax-exempt, non-profit foundation has developed and expanded programs to honor our fallen fire heroes and assist their families and coworkers. About Common Voices: Common Voices (www.fireadvocates.org) is an advocates’ coalition of members who all have been directly affected by fire. By bringing their voices together, they hope to educate others regarding fire and its devastating impact. Their mission is to create a fire-safe America by sharing their stories, creating resources that educate and sharing fire statistics. About Center for Campus Fire Safety: The Center for Campus Fire Safety (www.campusfiresafety.org ) is a non-profit, member focused organization devoted to reducing the loss of life from fire at our nation’s campuses. The mission of The Center for Campus Fire Safety is to serve as an advocate for the promotion of campus fire safety. The Center serves as the focal point for the efforts of a number of organizations and also as a clearinghouse for information relating to campus fire safety. Common Voices advocate Bonnie Woodruff wrote and distributed the following open letter following the tragic San Marcos fire in Texas. We applaud her courage to speak out on such an important topic. I have watched the San Marcos fire tragedy unfold in San Marcos, Texas this past week with a heavy heart. 5 student lives confirmed lost, 6 injured, 200 displaced and others still missing. It’s a mother’s worst nightmare, and it’s one I’ve lived. It’s been 22 years since I lost my son, Ben, in a fire at the University of North Carolina. Ben died, along with 4 of his friends, in the Phi Gamma Delta fraternity house fire that changed our lives forever. It was graduation day, it was Mother’s day….May 12, 1996. Fire didn’t care about any of the celebration plans we had for that day, and 5 lives were cut short. Following the tragedy, I became involved in campus fire safety advocacy and have spent many years sharing Ben’s story in hopes that other lives will be saved. I am a proud founding advocate of Common Voices, an advocates’ coalition determined to create a fire safe America. We’ve made progress, but there is still so much work to do. The fire in San Marcos underscores the importance of this and I felt it appropriate to reach out again. Texas State University students are now reminded of the facts about fire in a way that no one wants to be. How can this tragedy serve as a wake-­‐up call to universities, student and parents across America? One way that I know of is to send my plea once again to parents of students who will be heading off to college this fall. Does your student’s housing include fire sprinklers? Please look up for fire safety. Make sure that fire sprinklers are present and that there is a properly installed and working smoke alarm system. Encourage everyone to PRACTICE an escape plan. Whether your student is living on campus or off, the questions are the same and you are kidding yourself if you believe that fire can’t happen to you and your family. Fire is fast. Fire sprinklers are needed. Let’s all join together and make sure that fire safety is on our back to school checklist. Tragedies can be prevented. Ask the simple questions and make decisions based on the answers. Don’t choose on campus or off campus housing that doesn’t include fire sprinklers. According to an article in the New York Daily News, yesterday’s apartment fire was described as a “raging inferno.” FDNY Commissioner Daniel Nigro stated, “The fire was a difficult fire. The apartment was quite large and 50 stories up.” He also made it a point to note that the building’s residential floors lacked fire sprinklers. Linthicum Heights, Maryland – The National Fire Sprinkler Association (NFSA) is proud to announce its 2018 award recipients. The awards will be presented at the Association’s Annual Awards Banquet to be held Friday, May 5, 2018. John (Jay) C. Livingston, a fire sprinkler contractor, was selected to receive the Golden Sprinkler Award. Jay is owner and founder of Livingston Fire Protection, Inc. (LFP). LFP is over 53 years young, an amazing achievement in any industry. Mr. Livingston has positively contributed so much during this tenure, and continues to do so today. Jay has a heart of gold and lives for his family and for the fire sprinkler industry! He and his company are deeply involved in community service and have donated not only untold hours of service, but free fire sprinkler systems to two homeless centers, two residences and one school for children needing scholastic tutoring and after school places to learn (material donations were by manufacturers and distributers). Jay has written many articles published in Sprinkler Quarterly, Fire Protection Contractor, and numerous other publications. Jay is a member of the NFSA Hall of Fame and played a key role in the establishment of NFSA’s Capital Region Chapter. The Russell P. Fleming Technical Service Award will be presented to George Stanley of Wiginton Fire Systems. George is Vice-Chair of NFSA’s Engineering &Standards Committee and has worked at Wiginton Fire Systems since 1973. Underspoken, yet focused on technical solutions on behalf of the NFSA and the entire fire sprinkler industry, George has held every sprinkler contractors position within Wiginton and has served steadfast for 45 years. The Leadership in Public Safety Award is the NFSA’s highest award to a fire official or advocate and will be presented to Charles Hood, San Antonio Fire Chief. Hood was instrumental in efforts to retrofit residential high-rise buildings in San Antonio following the tragic Wedgwood fire in 2014. He, and his team have worked to identify all high-rise buildings in their fire district that are not protected with fire sprinklers, and are now working to bring all of those buildings up to code with the inclusion of fire sprinklers. Hall of Fame recipients will also be honored. Hall of Fame inductees have contributed nearly all their working lives to improving the fire sprinkler industry. Frank J. Fee, III, Reliable Automatic Sprinkler Co., Inc.
John Joyce, Geo. M. Robinson & Co.
Linthicum Heights, MD – The National Fire Sprinkler Association (NFSA) advised its Board of Director members this week of 4 new hires in upcoming weeks. The positions of Director of Operations, Director of Field Operations, ITM Specialist, and Field Service Coordinator have been filled with start dates of March 5, March 15 and April 1 respectively among them. Director of Operations is Chief Dennis Wood, a Maryland native who joins NFSA from a career within the Prince Georges County Fire Department. Wood will begin work on April 2, 2018 at the headquarters location in Linthicum Heights. Wood most recently served as the Deputy Fire Chief of the Emergency Services Command, retiring after 23 years of service. He has experiences in guiding operations, community risk reduction, capital improvement project management, budgeting, performance measurement, hiring and promotion processes, career development, hazardous materials, training and fire prevention and code enforcement. His combination of experiences and education has led to being published in trade magazines and he has lectured extensively on many facets of emergency services at local, regional, state and national conferences. Director of Field Operations is Chief Gary West, a Tennessee native who leaves his most recent post as Deputy Commissioner, Department of Commerce and Insurance for the State of Tennessee, serving as Tennessee State Fire Marshal. West will also begin work on April 2, 2018, with his home office in Tennessee being his primary station. However, West will travel nation-wide as the leader of the NFSA Field Operations team — which now includes 22 team members in 17 different states. West brings many years of local, municipal, and state government experience to the role of Director of Field Operations which will prove valuable as a teammate to the NFSA personnel in Field Operations. These experiences span from local county and city issues, to state and national issues, which NFSA faces on a daily basis. His experience with education focused on community risk reduction will be a perfect fit for the team, and his strong customer service skills combined with a strong work ethic will be an added bonus as he serves NFSA members across the nation. Sprinkler and Alarm in Maryland. Field Service Coordinator is Terin Hopkins, who brings over 35-years experience as a local authority having jurisdiction (AHJ), most recently with Howard County Maryland Department of Fire & Rescue Services – Office of the Fire Marshal. Prior to that, Hopkins was with Prince George’s County Maryland Fire/EMS Department. 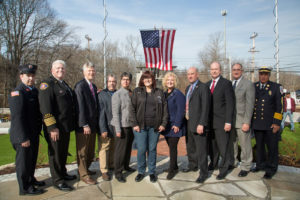 WEST WARWICK, R.I., Feb. 21, 2018 /PRNewswire-USNewswire/ — The National Fire Sprinkler Association (NFSA) was honored to be part of yesterday’s memorial service held at the site of the Station Fire in West Warwick, Rhode Island. Fifteen years to the day, organizations came together to remember those who lost their lives, honor those who survived, and share information about fire sprinkler incentives. NFSA joined Common Voices, Phoenix Society for Burn Survivors, Station Fire Memorial Foundation, National Fire Protection Association, Congressional Fire Services Institute, U.S. Fire Administration, International Association of Fire Chiefs and National Fallen Firefighters Foundation leaders to commemorate the event. Over 100 people attended the national press conference which was streamed live nation-wide. The NFSA team was led by long-time fire safety advocate Jim Dalton, who spent many days over the past 15 years meeting with legislators, their staffers, and fire service stakeholders who also championed this legislation. He was joined throughout this process by Vickie Pritchett, NFSA Director of Outreach and Government Relations. The Tax Cuts and Jobs Act contained several critically important provisions which will provide significant incentives for property owners to install fire sprinklers. Small businesses will now be able to fully expense-in fire sprinklers, under section 179 of the tax code, up to a cap of $1 million in each year of expense. This will allow for the retrofit and upgrading of numerous occupancies such as nightclubs. In addition, small businesses that may need to borrow money to pay for the retrofit will be able to fully deduct the interest expense on the loan. Advocates and the fire service can now promote fire sprinklers and overall improvements to fire protection in existing small businesses that will prevent loss of life, injuries, emotional distress, bankruptcy, and even imprisonment, all of which occurred in the aftermath of the Station Fire. These days are behind us, but we will always remember this event and the toll it took on America. We will continue to promote the cause of fire safety. Hand-in-hand with all stakeholders, we will continue to persevere. WASHINGTON, Dec. 21, 2017 /PRNewswire-USNewswire/ — The National Fire Sprinkler Association (NFSA) praised sponsors and co-sponsors for their consistent leadership over the years that ensured fire sprinklers were included in the tax reform legislation passed by the House and Senate yesterday. The Fire Sprinkler Incentive Act has been pushed for years. Fire protection has now been included and overall fire and life safety systems have joined other tax incentives such as roofing, HVAC and security alarm systems. The NFSA team was led by long-time fire safety advocate Jim Dalton, who spent many days over the past 14 years meeting with legislators, their staffers, and fire service stakeholders who also championed this legislation. He was joined throughout this process by Vickie Pritchett, NFSA Director of Outreach and Government Relations. Small businesses will now be able to fully expense installation of fire sprinklers under section 179 of the tax code up to a cap of $1 million in each year of expense. This will allow for the retrofit and upgrading of numerous occupancies such as nightclubs. In addition, small businesses that may need to borrow money to pay for the retrofit will be able to fully deduct the interest expense on the loan. Larger entities can fully expense capital expenses over the next five years. Starting in 2023, the amount that can be expensed will slowly taper down. This part of the provision means that fire chiefs and local policy officials can now ensure business owners have five years for full expensing, which we believe will provide the opportunity for many high-rise and other high-risk occupancy buildings to improve their fire safety features. Tragic fires and significant property loss continue to plague our country. From President Harry Truman’s report on fire prevention in 1947 to President Nixon’s U.S. National Commission on Fire Prevention and Control which produced America Burning, progress has been made in America. However, approximately 3,000 still die annually due to structure fires. Our fear is that this number could rise. The American Fire Service has fought for years to establish incentives for business and property owners to be able to do the right thing. The Tax Cuts and Jobs Act provides these incentives. This legislation, coupled with the latest model building and fire codes from the International Code Council (ICC) and the National Fire Protection Association (NFPA), will lead to a safer America. HONOLULU, July 15, 2017 /PRNewswire-USNewswire/ — Yesterday’s tragic high-rise fire is a sombering reminder that high-rise buildings without fire sprinklers place occupants and firefighters at great risk. 3 people are confirmed dead and over 15 injured in a 5-alarm fire that started on the 26th floor of the Marco Polo building. The National Fallen Firefighters Foundation (NFFF), Common Voices, and the Phoenix Society for Burn Survivors and all those we represent sends our heartfelt sorrow to the victims and survivors of this tragic fire as well as the firefighters who had to face the challenges and trauma of such an incident. It is our hope that all Hawaii policy makers learn from this fire and work toward fire sprinkler retrofit legislation to ensure that it won’t happen again. Federal legislation (S.602 & H.R. 1481), filed in the 115th Congress, would provide incentives to owners to retrofit with fire sprinklers. This legislation is what America is all about, a public/private partnership that keeps citizens and firefighters safe while saving businesses money. Hopefully, America’s congressional leaders will realize that this legislation can help prevent tragedies like those that happened last week in London. For more details about the National Fallen Firefighters Foundation’s Life Safety Initiatives, please visit www.firehero.org . NFFF was created by Congress to lead a nationwide effort to remember America’s fallen firefighters. Since 1992, the tax-exempt, non-profit foundation has developed and expanded programs to honor our fallen fire heroes and assist their families and coworkers. TALLAHASSEE, Fla., June 27, 2017 /PRNewswire-USNewswire/ — On June 26th, Governor Rick Scott of Florida vetoed HB 653, a bill that would have allowed high–rise buildings in Florida without adequate fire and life safety systems to forego the retrofit of fire sprinklers and/or engineered life safety systems in these buildings that are currently required to come into compliance by 2020. The recent Grenfell Tower fire in London underscored the importance of fire sprinklers and Governor Rick Scottunderstood the ramifications. His actions were bold and hopefully lay the groundwork for a new era of policy makers who understand the impact of fire. The National Fallen Firefighters Foundation (NFFF), Common Voices, and the Phoenix Society for Burn Survivors all join to applaud Governor Scott for being a proactive leader who includes fire sprinklers to ensure quality of life for citizens and visitors of Florida. Businesses and advocates are all interested in life safety and sustainability. Everyone’s success is a key to the quality of life in any community. Blame after the fact never does anything positive, this veto is an example of good decision making where a balance of life safety and sustainable businesses can co-exist.